Lowdown: A boy is challenged by being left alone at home during Christmas. I have a bit of a loaded history with 1990's Home Alone. Way back in the early nineties there was a movie that got me hooked on being able to watch at properly at my home with all the glories of its glorious sound design. That movie was Terminator 2 (aka T2), and the perspective of time makes the lengths I went through in order to achieve that goal seem insane. I bought myself an entire laserdisc based home theatre system out of my then meagre salary just so I could watch one movie "the right way". Anyway, as the story goes, I got my laserdisc player together with a copy of T2. Alas, that player turned out to be faulty; it scratched all the discs it was playing. By "all" I mean the T2 laser I kept watching again and again. Thus, after a three day weekend, I had to return the player and the now damaged disc to the shop. Given that those were the days when putting one's hands on a copy of a movie was a pretty tough call, the shop did not have another copy of Terminator 2; as far as I know, no one had one in the whole area. 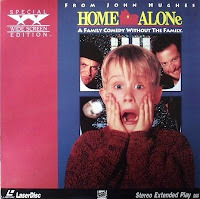 The only other laserdisc they did have in stock was Home Alone. And thus I ended up with Home Alone along with a new laserdisc player. Since Home Alone is nothing like Terminator 2 I couldn't really stand watching it; it did not take long before I exchanged it with another laserdisc (Alien 3, I believe; it took several months before fresh copies of T2 became available). I got to become a much mellower person through the years, learning to be able to appreciate movies even if they do not feature a Harley chasing down a semitrailer that's chasing down an off-road motorcycle down a canal. This past Christmas we saw a clip from Home Alone on TV; my son loved it, so we gave the movie a go. Hell, back in the nineties I had no idea what Christmas was all about; at least now I know what they mean when they say that "Home Alone is a Christmas movie". The premises are famous by now (hence the numerous sequels): a naughty boy (Macaulay Culkin) is accidentally left alone at his home while his family goes to a French vacation. The family is unable to quickly rectify its mistake, so the boy gets stuck at home, alone, for Christmas. During those holy days the boy learns to appreciate his family, now that they're gone, while the family learns to appreciate how much it loves its boy, as naughty as he is. The catch? Our boy has to defend his house from a couple of burglars (Jo Pesci and Daniel Stern) who seek to take advantage of a neighbourhood emptied for the holidays to make their killing. Home Alone develops slowly along familiar Christmas and family themes. I will grant it: it is a very effective family Christmas film that can be enjoyed even by the likes of yours truly, a fellow who could not care less about Christmas traditions given him growing up with none and his general views on matters of religion. When all is said and done, though, Home Alone is remembered for two things: Culkin's groundbreaking performance, a child proving able to carry an entire film upon his shoulders (a feat subsequent movies by director Chris Columbus in the Harry Potter series failed to achieve). The second is, of course, the collection of hilarious action scenes that conclude the movie as the boy defeats the thieves in various ingenious ways. Let's be honest: Christmas movie or not, these are the scenes everybody remembers Home Alone for. Overall: A nice film for the right family holiday mood that's made even better by the action at its end. It's a pity that action takes its time to materialise and that it doesn't last half as long as it should, though. 3 out of 5 crabs; I like it, but I still think T2 is leagues apart.